How Much Yield Loss Occurs with Corn Hybrids Sold as Organic? Farmers growing corn for the organic market often get a premium and rightly so. Organic farmers are required to go through a certification process that requires a fee and extra effort and time for paperwork. They have more expenses due to increased pest control, especially weeds. Organic farmers have also expressed some concern about the genetic yield potential of the commercial hybrids used in organic corn production. Since 2004, the UW Corn Hybrid Evaluation program has been testing corn hybrids sold for the organic market. 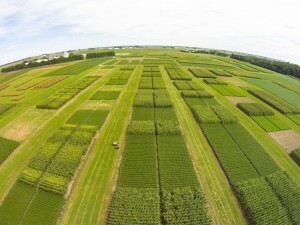 A total of 55 organic hybrid trials have been conducted at 10 locations in Wisconsin (see http://corn.agronomy.wisc.edu/HT/). Organic hybrids yielded 7% (14 bu/A) less than the conventional hybrids when grown together. Comparing separate organic and public trials, the hybrids in the organic trials yielded 12% (24 bu/A) less than hybrids in the public trials. In both analyses, organic hybrids yielded less than modern hybrids. In the organic trials, the conventional check hybrid was consistently the top performing hybrid in the trial. However, the commercial organic hybrids were not far behind. In these trials, all interactions are minimized to the best of our ability, so the trials represent potential genetic differences. As plant stresses increase in organic systems due to management constraints for certification and pest pressure versus the relative ease of controlling some of those same pests in conventional systems, the relative differences between modern organic and conventional systems would also likely increase. Previous post: Do We Grow Another Bushel or Save a Buck?